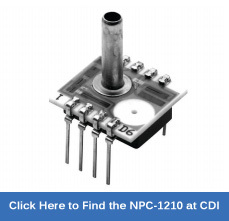 The NPC-1210 medium pressure series of solid-state pressure sensors are designed to provide a cost effective solution for applications that require calibrated performance over a wide temperature range. Packaged in a dual-in-line configuration, the NPC-1210 Series is intended for printed circuit board mounting. Optional pressure port and lead configurations give superior flexibility in low profile applications where pressure connection orientation is critical. The NPC-1210 medium pressure series is based on NovaSensor’s advanced SenStable® piezoresistive sensing technology. Silicon micromachining techniques are used to ion implant piezoresistive strain gages into a Wheatstone bridge configuration. The NPC-1210 Series offers the added advantage of superior temperature performance over the temperature compensated range of 32°F to 140°F (0°C to 60°C). A gain set resistor is included to normalize the FSO for field interchangeability. The NPC-1210 series is available at CDI in pressure ranges from 0 to 5 psi (0 to 0.34 bar) through 0 to 100 psi (0 to 6.89 bar). Click here if you are looking for a different range. Click here to send a technical inquiry.